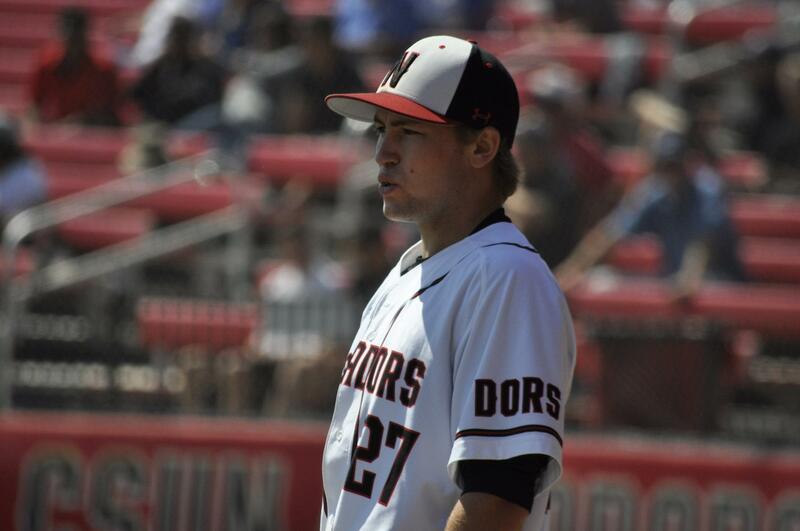 The CSUN Matadors avoided the sweep with an 8-5 victory over Long Beach State on Saturday, thanks to three hits and four RBIs by first baseman Albee Weiss. Matadors scored all of their runs with two outs, three of them coming while down in the seventh inning to take the lead for good. The Matadors got the scoring started in the fourth with an RBI double by catcher Dylan Alexander, who had a career-high four hits in the game, giving them their first lead of the weekend series. After allowing a run to score in back to back innings, the Matadors took back the lead with a couple of RBI doubles in the sixth by Alexander and right fielder Nick Sablock making it 3-2. Still, Long Beach State kept taking the lead with two runs in the bottom of the sixth, but Weiss came up in the seventh with a man on and hit a two-run home run, his seventh of the year, which ended up being the game winner. Alexander added another run with an RBI single, his third of the game, and in the eighth inning, Weiss made it 8-4 with a double that scored a couple of runs. Matador starting pitcher Andrew Weston had an impressive outing going eight innings and never allowing the game to get away from them keeping the runs to a minimum. Weston came out to pitch the ninth but after a double, a single, a walk and a run to make it 8-5 he was replaced by relief pitcher Conner O’Neil. O’Neil, with the tying run at the plate and zero outs, proceeded to strike out the side getting the save and giving the Matadors the win. The Matadors stay on the road Tuesday and take on Loyola Marymount at 6 p.m.